finding the book that heals: literature therapy: The days of the Wild West—do you yearn for those old timey ways? The days of the Wild West—do you yearn for those old timey ways? Growing up in Calgary, Alberta, Canada, I have been well indoctrinated in the glory days of the wild west. Especially during the Calgary Stampede, when all citizens and tourists are encouraged to put on western costumes and call each other pard’ner, are we reminded of the city’s early glories. 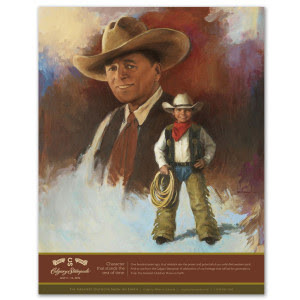 The official 2012 Stampede Poster claims it clearly: somehow, there’s a lot of integrity associated with the wild west. Just look at that sentimental set of eyebrows on the adult version of that cowboy. Whoooeee. Not only was I brought up in this strange land, I lived for five years in a gold rush spot. In fact, there was so much gold in the ground that a visiting geologist felt compelled to write us a report. If we dug up every inch of our garden, meadows and homesite, for two weeks we could make over two hundred dollars a day. The property would have been reduced to tailings and heaps of toxic chemicals, but there you go. One year we did have an actual gold panner take up residence at the creek, having legally staked a claim. He lived in his twenty year-old stationwagon that was loaded with the stuff you see on Hoarders. We locked our doors at night. So I found The Sisters Brothers to be a refreshing and realistic take on what the wild west was really about—appalling violence, shame, and greed. The narrator is the younger brother of an infamous duo of hired killers. DeWitt characterises the young fellow's earnest desire by having him tell his story in an amusingly floral and formal style: "My very center was beginning to expand, as it always did before violence, a toppled pot of black ink covering the frame of my mind, its contents ceaseless, unaccountably limitless. My flesh and scalp started to ring and tingle and I became someone other than myself, or I became my second self, and this person was highly pleased to be stepping from the murk and into the living world where he might do just as he wished. I felt at once both lust and disgrace and wondered, Why do I relish this reversal to animal?" While the older brother has no qualms about killing for money, the younger feels better if he can rationalise that the victim was basically a bad person, so removing him from the population would somehow improve others’ lives. Even so, the narrator doesn’t stand up to his older bully of a brother, and gets roped into all sorts of unpleasant shenanigans. Luckily the story is told with a refreshing humour, awe and acknowledgement of shame, all at the same time. At one point the younger brother is so polite that he drinks coffee offered to him by an old prospector. It tastes dreadful, and is in fact not made from coffee but dirt. Despite being able to kill all sorts in the most violent manner possible, the narrator can’t bring himself to hurt the old crazy coot’s feelings. The final straw for the younger brother comes when the man they are hired to kill is good at heart, looking for and finding the goodness in others. This fellow has lived a strange life , but he has somehow invented a formula for easily extracting gold from the land. All in all, I couldn’t help liking the narrator, but I would have preferred he stood up to his brother. We have a bit of a deus ex machina ending here in that the problem with the brother is a bit too neatly resolved, but otherwise this novel is like a cool, clean drink of springfed water after swilling weak American beer and tons of koolaide. As far as literary therapy goes, not everybody needs help with overcoming sentimentality around the days of the wild west, but it helped this Calgarian to find balance again during Stampede Week.